Little Miss likes to write on her shoes from time to time so when we were asked to test out the limited edition Custom Shoes by Bobux - it was an easy choice and a cute surprise for her! In my mind, every child likes to be individual and these Custom kicks helps them show their creativity more than once either by colouring in the characters on the shoes in their favourite colour(s) or/and writing their name or anything they like on them really! The best part - the special pens that come with the shoes wash off! The Custom shoes by Bobux are only available in the Kid+ range sizes. They are unisex, so comfortable and you can change the design by simply wiping off the colour off the shoe with water and start again! They are made with high quality coated leather upper, have a breathable cotton lining and Velcro strap fastening which allows for greater adjustability. The fun character illustration designed by Bobux’s own Audi Siregar along with your child's unique touch and colour choices will make these shoes one of a kind! Kids will love these unique and limited edition shoes - we sure liked them! Little Miss cannot wait to show her friends HER unique new shoes and write all over them and write her name in bold ha! 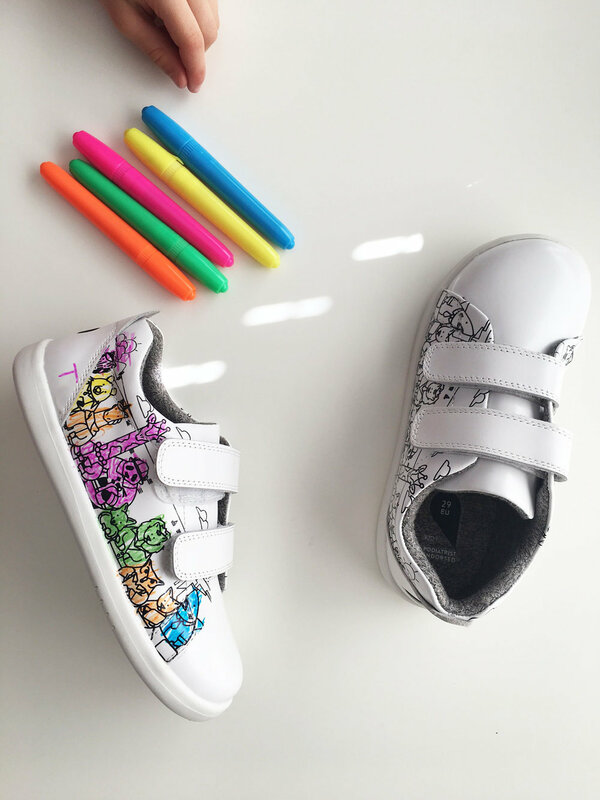 The Custom Shoes by Bobux are limited editions - so be quick to grab your kids a pair before stock runs out! For more information, head to their website. If you love the look of these cool Bobux shoes, follow Bobux on Facebook or Instagram to stay updated on their upcoming Spring/Summer Season launch. We can't wait to see what they have instore! To celebrate these awesome one of a kind limited edition kicks, we are giving away ONE pair of Custom Shoes valued at $105 RRP to one of our lucky subscribers!! Note: The shoes are only available in Kid+ sizes sizes 27 to 33. To enter, be sure to be subscribed to our newsletter. If you haven't yet, you can signup here. And jump to the widget below to enter! Good luck! Conditions: Only NSW or VIC residents can enter this giveaway. The winner will be announced on Wednesday 2nd of August at 5 PM AEST. If we don't hear from the winner within 24 hours, the prize will be redrawn. This giveaway is not sponsored and not affiliated with Facebook or Instagram. To read more of our product reviews, head to our dedicated page. For more ideas on what to do with your little ones, head to our blog for lots of ideas of places, events, programs and activities you can attend.